In time, they might come to call it the Tsipras Gamble. With an impossibly weak hand, no one seriously thought Syriza could pull it off. The verdict of the bail out referendum was predicted to be close, so close that it might well have been Syriza as opposed to Greece heading for the exit door. Predictions were made and screeds written on the genius/idiocy of Tsipras, but whatever side one took everyone inside and outside Greece forecast a tight vote (including, um, me). That, it was suggested (and indeed, was actively hoped-for in some quarters) would have tied the hands of the Greek negotiating team in meetings with the troika. And so the decisive result, 61% no to 39% yes is of huge significance. It represents two things, both of which are troubling for the status quo across Europe and the nature of the European project itself. In their decadent determination to imprison Greece behind ever thicker walls of debt, the Commission, the ECB, and IMF have progressively undermined the likelihood that the full amount of monies lent will ever be seen again. The demands that the hard pressed majority of the country have to pay up to stay within the (ideologically defined and selectively enforced) set of rules governing relationships between creditors and debtors have set themselves up for a huge fall. While they and their proxies in the Greek opposition threatened the fiscal equivalent of thermonuclear doom, the ground of national pride and democratic self-determination was ceded to Syriza. Tsipras didn’t run rings around the troika because of Napoleon-like genius – he did it because he knows austerity is a political matter, while his opponents have managed to convince themselves it’s a matter of technocratic decision-making and economic necessity. The margin of victory, won in the teeth of a near unanimity of yes propaganda pouring from media outlets, means that when the troika meet the negotiating team again, they know there’s a solid democratic mandate behind them. It also means something of a precedent has been set. Should Portugal or Cyprus say find themselves in further difficulties, referenda are a proven counter measure to the weapons of economic devastation. The leading representatives of the EU establishment are not used to dealing with a democratic upsurge. The EU, after all, has always been an elite project with marginal input from EU citizens, apart from sparsely-observed elections once every five years. The shoddy way the troika have treated Greece is not lost on tens of millions who switch on their news every night. The awful behaviour of Merkel in particular does not reflect favourably on the EU. It’s already in the legitimacy doldrums as far as many right wing voters across Europe are concerned. Therefore, it’s bonkers to risk the political capital the EU has with people of a centre left persuasion – particularly when Dave’s vainglorious and totally unnecessary in/out referendum in Britain slowly but surely approaches. Merkel and co. would be extremely foolish to persist in the hard line they’ve so far pursued. And there appears to be signs of movement – Merkel and Hollande are jointly convening a Eurozone summit for this Tuesday in response to the referendum. What will win out, the short term placating of voices at home calling for no more Greek bail outs or continued commitment to the Euro and EU? At home, the win has cemented Syriza’s position not just as the government (despite, formally, still being a coalition) but as the hegemonic force in Greek political life. It’s a lesson all parties of the left can learn from. 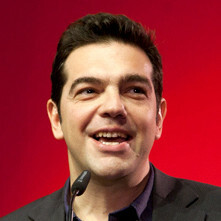 Tsipras didn’t just campaign on national sovereignty and democracy, Syriza has won the argument on economic competency. As I’ve argued previously, Syriza has promised to manage Greek capitalism better than the capitalists. Their demands are more than just the “isn’t it awful” rhetoric that, unfortunately, colours most of the left’s anti-austerity campaigning here. It’s bound up with a convincing, credible economic model that has something to say to layers of capital as well as labour. Their opponents to the right don’t have anything apart from doom-mongering and more misery on offer (unsurprisingly, the official leader of the opposition, Antonis Samaras has resigned as the right fall into disarray), and the left have either capitulated (PASOK) or consigned themselves to irrelevance (KKE). Whatever happens, Syriza’s position bristles with the democratic weaponry handed to them. Opposition at home and abroad cannot touch them, for a time at least. Now what? From the right, Fraser Nelson runs down the dangers of the situation. But there are opportunities too. The risk of financial contagion might focus minds at Tuesday’s Eurozone meeting to hammer out something that might inject a bit of stability into the situation. Like following the IMF’s recommendation that Greek debt be restructured with some necessary write down. Perhaps even a touch of quantitative easing might be indulged seeing as the deflationary pressures on the European economy remain (provided Germany overcomes its understandable reluctance to do so). As the banking crisis in 2008 reminds us, neoliberal dogma can go out of the window if the system is imperiled. There’s a geopolitical dimension too. Russia as a possible source for a Greek bail out has been discussed and dismissed thanks to collapsing energy prices. However, perhaps now mainstream comment and EU watchers will pay more attention to the invitation Greece received from Brazil, Russia, India, China, and South Africa (the so-called BRICS) in setting up a new development bank. Ostensibly to fund development in emerging economies, in practice it will provide an alternative to both the IMF and World Bank. Rather than accept the punitive strings these outfits have customarily attached to “assistance”. It would be a major coup and a blow to the financial status quo if a developed economy, cut adrift by a short-sighted troika was to act as a fiscal honeypot for European states in trouble. That doesn’t mean Greece can be ejected from the EU only to fall into the arms of the BRICS in short order, but in the medium to long-term the IMF and its friends might not want to facilitate the development of a rival. Wow! The Opinion Polls got it wrong; they were predicting a close finish. Here we have a definitive clear cut result a 2:1 victory! What was the actual question the ordinary Greek voter was supposed to be voting on then? Print it out and see if you or I can make tail or head out of it. Dare you. But I do like the idea of the BRICs setting p their own Bank. Competition. So far the IMF has had its own way and a monopoly on screwing struggling Nations. Now its the turn of the Asian Tigers and The African Leopards and the South American Jaguars to have their turn in the sun. The West can go lick its wounds and rethink how it will deal with competition. Its a economic jungle out there. Now of course the Greek Government has to deliver, and sadly the EU Germany basically will be fighting it tooth and nail. It will depend if the Government has something up it’s sleeves to get extra funding will it print it’s own euro’s , does it have the money from loans from say Russia or other countries maybe China although I doubt it. I hope it has plans otherwise it could end up on bended knees to Merkel, because she runs the EU these days. Rather like Wilson and Healey going cap in hand to the MFI in the good old days! I’ve said elsewhere, an excellent opportunity for the Russians to get a foothold in the Med. The first thing to say is that not only are we shocked for the left to win but such a large margin, the media have been peddling the idea that of course the large dose of medicine of too little money available from the Banks, will have instilled a sense of reality into them, and they will now vote yes. The difference being of course is that it only exposed the real culprits, and that it left the Greek people with an obvious alternative, GREXIT. The fact is though that the Greeks would be better off exiting the Euro and printing their own currency, they could use that money then to rebuild their country and in doing so prove the Neo-Liberal agenda is destroying our economies. Professor Bill Mitchell explains why Europe is killing off the economy and that austerity is a means of transferring wealth and power upwards. A good international trade union campaign group recently made the excellent point that in 1953 the West bailed out Western Germany by writing off half of its Pre-War debts at a stroke as long as it then maintained a budget surplus (to keep it out of the Soviet sphere as the Cold War took off). And 60 years is a short time in politics. But the right wing German Govt has a short memory. Without the massive debt repayments Greece would have a small surplus and it could be argued that the EC leaders (who have all bailed themselves out with trillions of quantitative easing -denied to Greece) are acting like loan sharks lending more to those already in debt. We need a debt summit/conference to write off the debts of Greece and the other struggling countries. Owen Jones recently quoted Nobel Prize economists Klugman et al recommending a write off and then using quantitative easing for public investment and investment in renewables to kick start economies. This would probably work to an extent in a Keynesian fashion but of course as a democratic socialist I would go further by having windfall taxes on big business (who are on investment strikes), a significant EC Financial Transaction Tax & Common EC Corporate Tax, an EC living wage, more democratic public ownership and more democracy in general in the EC to kick Neo-Liberalism out. And by the way apart from the engineering export sector in Germany there has been wage suppression there and as per usual we have a timid SPD unwilling to challenge Neo-Liberalism. The Greek people have done us all proud – get them Elgin Marbles on the next RAF plane immediately as we write off the debts and offer the EC a fresh start through solidarity and democracy! The NO Vote is the final straw; the Greeks have lost their marbles.